Black-Eyed Peas are bursting out of their comfort food tradition in a gorgeous, healthy salad loaded with light and refreshing ingredients. 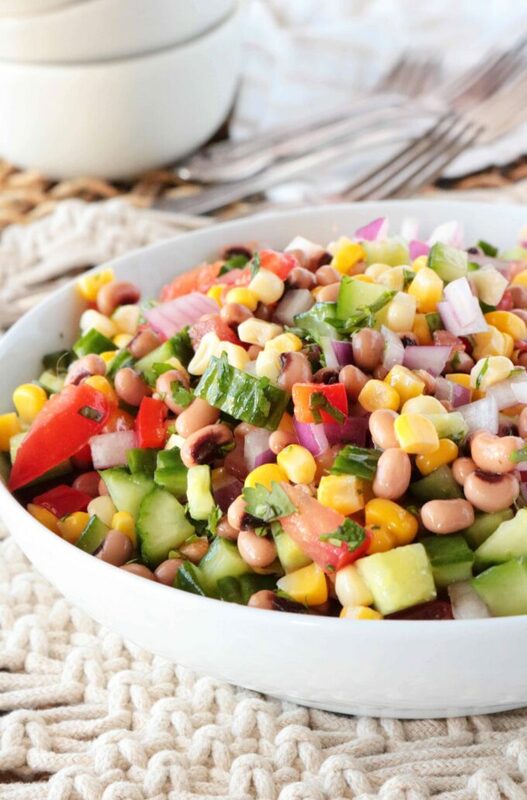 In addition to a perfect Black-Eyed Pea Salad loaded with flavor that can be served as the main event or on the side, we’ll also cover what exactly black-eyed peas are (fruit, vegetable, or legume), reasons why rinsing the star of the show is an essential step, plus tons of easy options for customizing your salad! While it is still somewhat of a mystery how today’s main ingredient landed in the U.S., it is widely believed the popularity of the black-eyed pea began to rise in the 1600’s after being brought over by slave-traders. The use and popularity of black-eyed peas continued to grow from there, and although native to Africa, they are now a Southern tradition. These days you’ll often find black-eyed peas in hearty, savory dishes like Hoppin’ John or simply stewed and served alongside cabbage, but these tasty little morsels need not only be reserved for comfort food. WHAT ARE BLACK-EYED PEAS — VEGETABLE OR BEAN? Contrary to popular belief, peas are not considered vegetables, but rather legumes (yes — even the green ones) which means black-eyed peas are in the legume/bean family. Even though they’re not technically considered vegetables, they’re still highly nutritious and come fully loaded with folate, manganese and vitamin A.
Toss them into a Black-Eyed Pea Salad? Now we’re really talking nutritious. 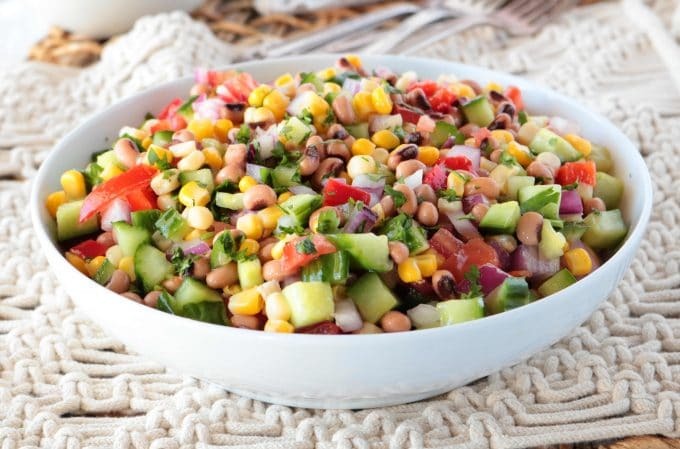 Black-Eyed Pea Salad is a colorful and tasty mix of vibrant fruits, vegetables, and black-eyed peas tossed together in a vinaigrette dressing. It can be served right away, but giving this dish a little extra time to marinate in the dressing can make a world of difference when it comes to flavor. Black-Eyed Pea Salad is not limited to the ingredients listed above, nor are you required to use all of the ingredients above in your own rendition. You can make Black-Eyed Pea Salad your very own by omitting the ingredients you don’t care for and adding in those you love. For example, if you love avocado, dice some up and toss it in just before serving. 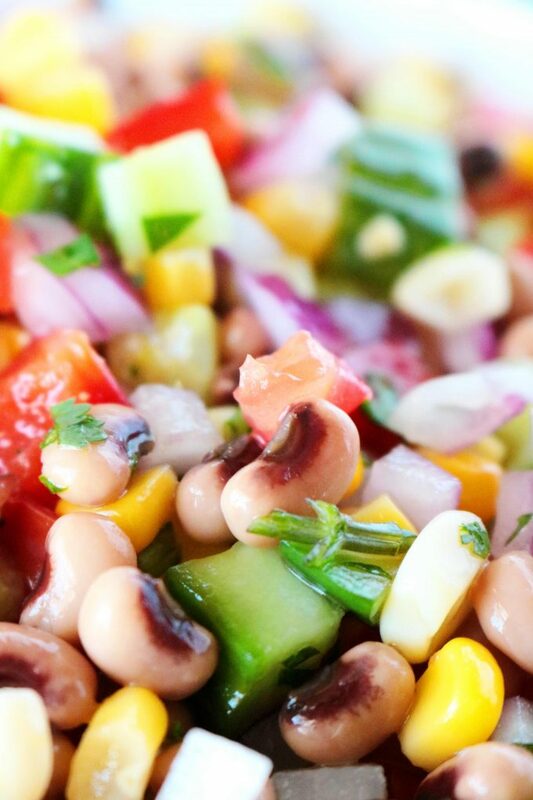 Want to make this Black-Eyed Pea Salad a little more savory? Give it some Mediterranean flare with some Feta Cheese and/or sliced olives. Like it hot? Jalapeño or serrano peppers would make for a spicy addition. And, if you’d like to sweeten things up a bit, try throwing in some diced mango. …SAME GOES FOR THE DRESSING! 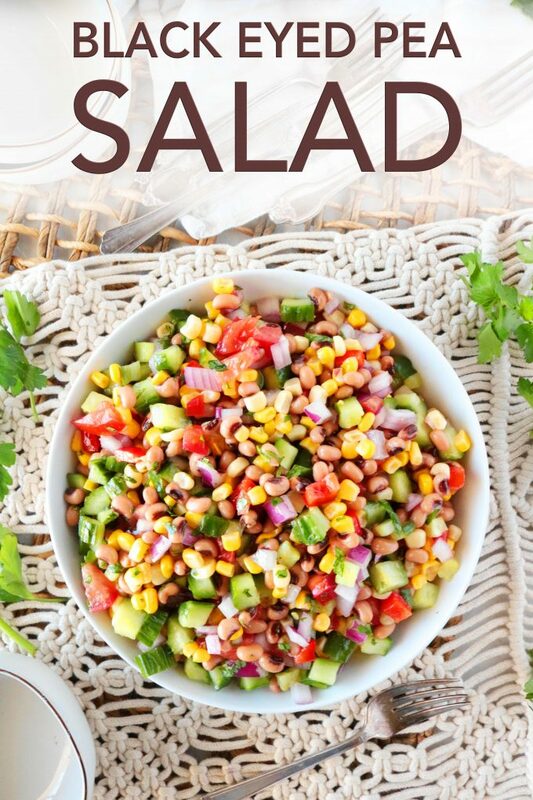 This Black-Eyed Pea Salad comes equipped with a quick and easy Red Wine Vinaigrette to perfectly complement your salad. However, if you would rather not make your own dressing, you could easily sub in a store-bought vinaigrette, Catalina dressing, Italian Dressing, or Balsamic Dressing. If using a store-bought dressing, add it in small increments (a 1/4 cup or less) and taste as you go so you don’t end up masking all those wonderful flavors within the salad. 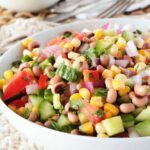 Black-Eyed Pea Salad is a no-cook dish that is actually better when made in advance, making it perfect for both meal planning and entertaining. You’ll simply prepare your ingredients, add them to a bowl, and pour over the dressing. It’s really that simple. Drain and rinse canned ingredients (black-eyed peas and corn). Prep and dice cucumber, tomatoes, bell pepper, and onion. Combine all of the ingredients, stir, and marinate. Anytime you’re adding canned beans to a salad, you really want to take the extra minute to rinse them. The starches attached to the beans will have somewhat of an unpleasant, gritty texture to them, and a simple run under the water will make all the difference in the world. There’s also quite a bit of extra sodium typically floating around in canned items, so taking a moment to rinse it off will give you more control over the level of salt going into your salad. This applies to both the corn and the black-eyed peas. Next, you’ll prepare your vegetables. If you can, try to make the cuts for each item close to the same size for a more uniform bite and even distribution of flavor. Once all of your salad ingredients are prepped and in the bowl, it’s time to dress the salad. If making the red wine vinaigrette, you’ll simply add vinegar, lime juice, sugar and salt to a small bowl. Then, drizzle in the canola or avocado oil. You’ll want to use flavorless oil for dressing this salad, so steer clear of olive oil this time around. Pour the dressing over the salad and, if you have time, allow it to marinate. Allowing the tang from the vinegar and lime juice to penetrate into each ingredient will take your salad from good to great! This salad can be eaten on its own, enjoyed over lettuce, mixed in with orzo pasta, served as a side dish, or even as a dip for tortilla chips, just like its famous cousin Cowboy Caviar! 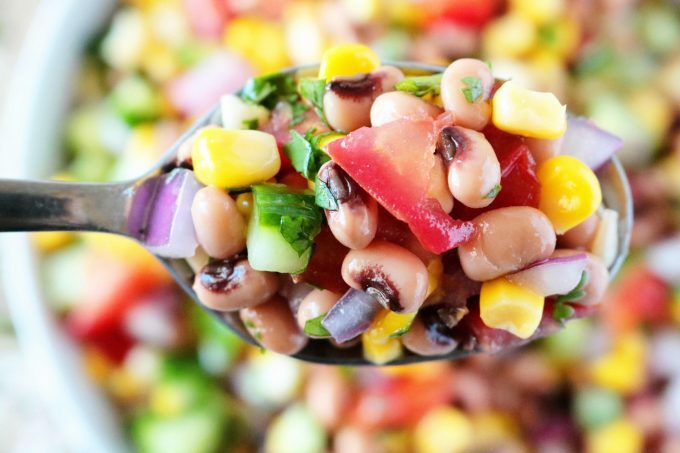 Cowboy Caviar is a zesty dip perfect for parties featuring black-eyed peas, peppers, onions, and corn! Fried Green Tomato Salad is about as Southern as it gets, loaded with fried green tomatoes, goat cheese, corn, and a zingy roasted red pepper dressing. Watermelon Salad with Feta and Arugula featuring cucumbers and serrano-lime vinaigrette is the perfect healthy salad recipe for warm weather and summer days! Tex-Mex Black Beans is a warm bean salad loaded with bacon, peppers, onions, and black beans. Perfect for both weeknights and entertaining! Mojito Melon Salad is full of cantaloupe, honeydew, and watermelon all topped with a minty-lime dressing. A sweet salad perfect for healthy snacking. 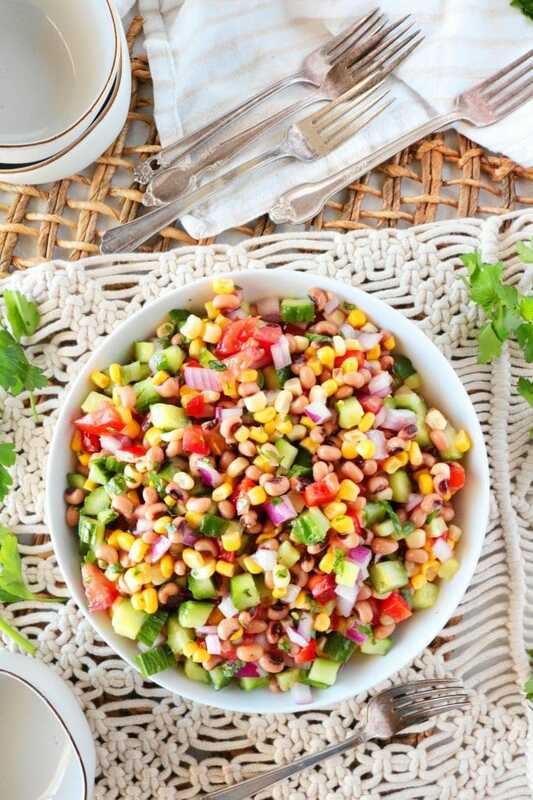 A quick and easy recipe for Black-Eyed Pea Salad featuring Southern black-eyed peas, corn, tomatoes, and more! Combine all of the salad ingredients together in a large bowl and stir to combine. If making the dressing, combine the vinegar, lime, sugar, and salt in a bowl. Very slowly, drizzle in the oil, whisking all the while. Pour dressing over the salad and toss to combine. Refrigerate at least 3-4 hours or up to overnight. Serve and enjoy. Your pictures are gorgeous! I haven’t tried many recipes with black eyed peas. This salad looks and sounds delicious. Looking forward to making it. This looks delicious. I am learning to love black-eyed peas! My new favorite way to eat them is fried with seasonings. They are so amazing. I love all legumes but I actually haven’t tried making black eyed peas yet! This is next on my list! I love legumes in salad. This looks so colourful and fresh! Def want to make this salad very soon!